Not only should the adults have all the fun but kids too!.Help make any baby shower, birthday, or just because gift baskets brighten up anyone's special ocassion. Each basket is filled with love and fun for the kids with toys, creative activities, and so much more so that you can't miss for any hard to buy for kid. ​ ​Each basket price does include shipping and we ask that you make your order two weeks in advance to insure proper delivery time for your basket to get to you when you need it. Each basket will be made within a day of ordering and then shipped out the following work day. Click the basket information link to see more about each basket and what comes in them. The perfect gift for a new mama and her baby. Basket comes with small things every mama could use when she brings her new baby home from bath items to socks for their tiny little feet. They even get a start on their babies reading as each basket comes with a book to read to them from the start of their life. 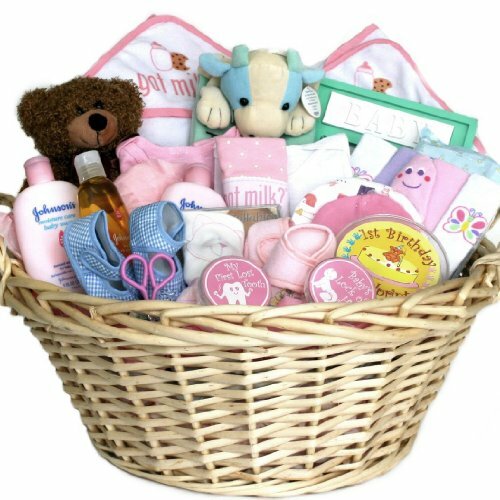 The basket alone will be neutral for either a boy or girl unless you specify and what colors you want to see incorporated in the ribbons and basket items. Also if you want a specific name added to the gift just let us know in the special instructions when placing your order. What can be more fun then receiving a gift full of things that will make your birthday even more exciting. 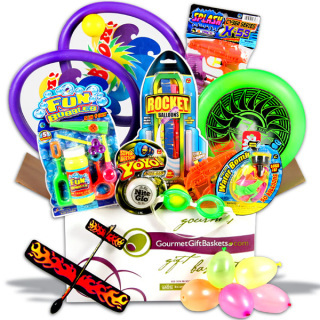 From party balloons and favors to toys and candy all together in one place as one gift! 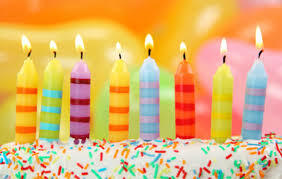 Help put a smile on the faces of the children in your life that mean a lot to you by choosing the Birthday Bash Gift Basket. Kids love two things, being creative and making a mess. Why not combine that in one gift? Give them a basket full of arts and crafts guaranteed to keep them busy and entertained for awhile each day. Give them a chance to showcase how creative they can be. If they aren't sleeping they want to play. 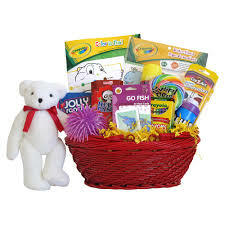 Give a basket to the kids in your life that will bring them hours of entertainment of playtime. From games to balls to toys for outside they will never be bored. Great for summer time, rainy days inside, and winter blues. Every little girl is a princess and loves to show everyone how much of a princess she is. 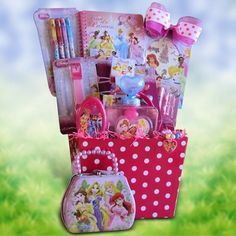 Help her find the princess she is with a gift basket full of princess items she will love. From snips and snails and puppy dog tails boys love to play like the big boys in their lives with cars, balls, and dirt. 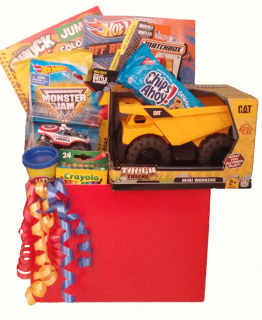 Help the little men in your life find joy in a basket full of what every boy needs from toy cars to things they can throw and watch their face light up with joy.